Chaana or cottage cheese is a very popular item in Bengali cuisine. It is used in various ways to make both savoury and sweet dishes. Of the savoury dishes some of the popular ones are chaana ar kofta, chaana ar danla, chaana ar cutlet and most of Bengali sweets are made of chaana. It is also eaten on its own with a bit of sugar or salt and pepper. The whey is also drunk as it is supposed to be very nutritious. I have grown up seeing my mother make chaana but had this idea that it would be a pretty difficult thing to do. All that was before I started making it. It is really easy and so worth the effort. Here is a quick tutorial on how to make chaana. Juice of one lime/ 2 to 3 table spoons of vinegar. Make sure that the vinegar you use does not have too strong a smell. Bring the milk to a boil. During the process keep stirring so that the milk does not burn. 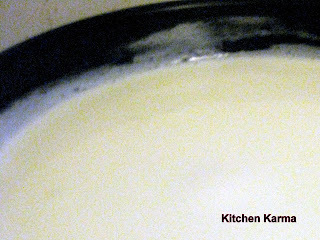 Lower the heat, and add the lime juice/vinegar slowly while stirring the milk. 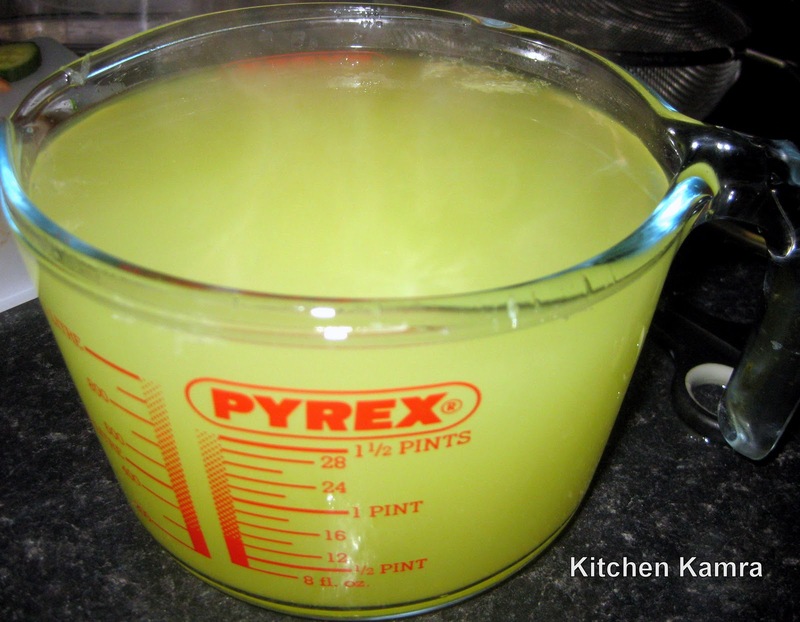 If using lime juice please use a strainer while mixing the juice with the milk so that the lime pulp is not added. After a minute or so the fat will separate from the whey. Keep stirring some more till the process is complete. If the process is not complete even after you have added the entire citric ingredient please do not panic.Sometimes it needs a bit more lime juice or vinegar to complete the process. This has happened to me a couple of times. Remove the pan from the heat and let it cool down for a couple of minutes. 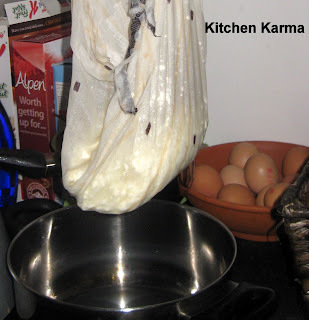 Spread a clean muslin cloth on a big strainer and balance both on a big bowl. Slowly pour the contents of the pot into the bowl. 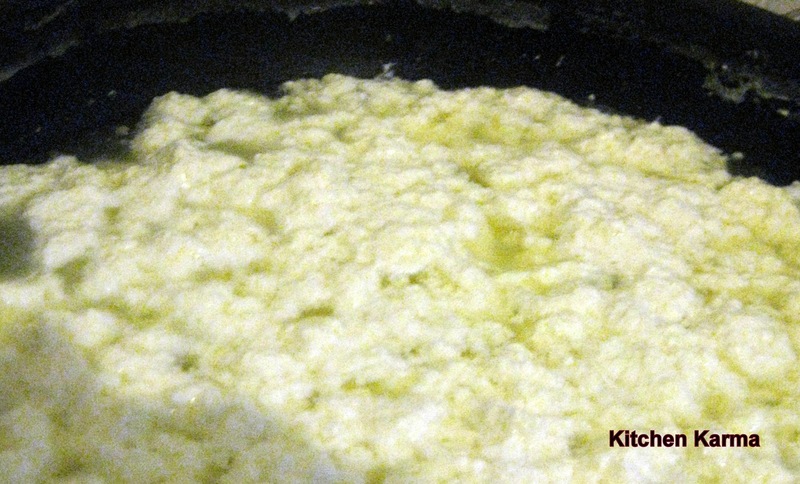 This way the cheese is separated from the whey. Then wash the cheese thoroughly in running tap water so that the smell of lime or vinegar is washed away. This cheese has lots of moisture in it, so the cloth has to be hanged with a bowl underneath where the dripping water can be collected. Leave this for 2 to 3 hours. After that time you will see that the cloth has become completely dry and when you bring out the cheese it is soft and smooth and no trace of moisture is left. Your chaana is ready. I was just reading your About Me page when this comment came through. Thanks a lot for visiting my blog.